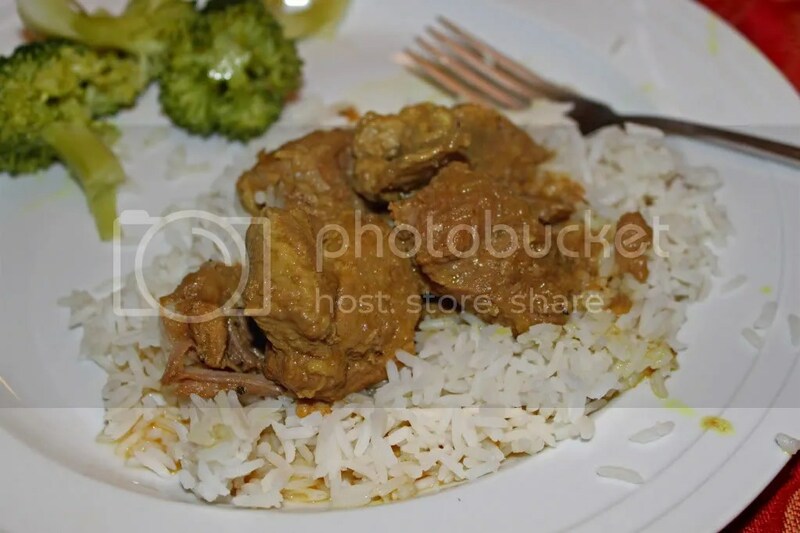 Pork shoulders are great for curry because 1) they’re cheap and 2) they’re big hunks of meat that needs to be cooked low and slow for a long time. They’re well marbled so there is lots of lovely fat to cook down and flavor the curry with. We bought our pork shoulder at Costco and it was HUGE so we only used about half of it, about 6 pounds worth of meat. Make sure you strip away some of the outside fat and any weird cartilage/connective tissue still on the shoulder, don’t want the meat to be tough or have weird chewy bits. After you’ve cleaned it off a bit, cut it down into cubes. All this meat prep can be happening while your base is cooking down. Again, it is the classic Burmese base: onion, ginger, and garlic. Cook this down till it is at the “sizzling point” (the point I referred to in my post on ohn no khao swe). Once your base is sizzling and translucent throw in some salt, pepper, turmeric, and a tiny bit of curry powder and let them cook for about 3 minutes. Then throw in your pork, give it a good stir, and walk away. Okay so don’t really walk away. In the beginning you’re going to need to stick around to stir it so none of the meat burns or gets stuck to the pot. But after a while you’ll be able to leave it simmering, only returning to stir every ten to fifteen minutes maybe. 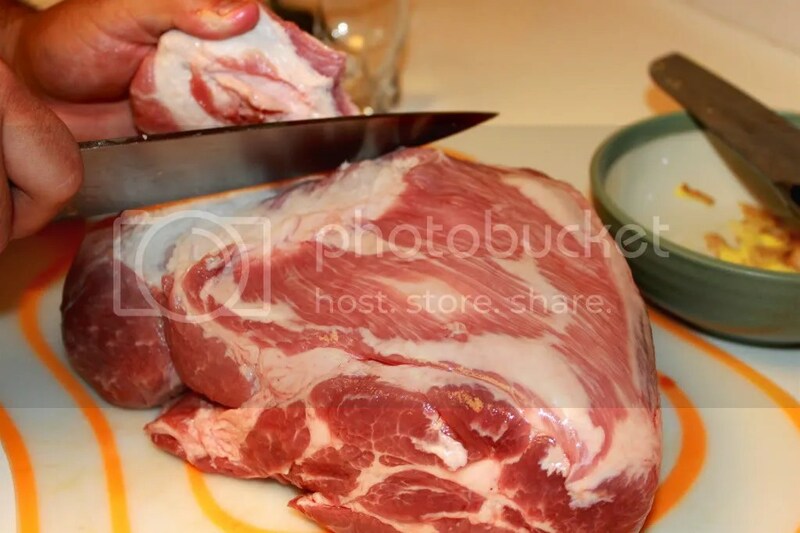 At first the meat will just be cooking through BUT after a while it will begin to release moisture. This is why its important to have a shoulder or another fatty piece of meat. If you use something too lean it won’t let off enough moisture/fat and you won’t have any broth. It’ll take about an hour or so to get really cooked down and delicious, but it all depends on your meat. You can tell when it’s getting close to done by looking at the meat. 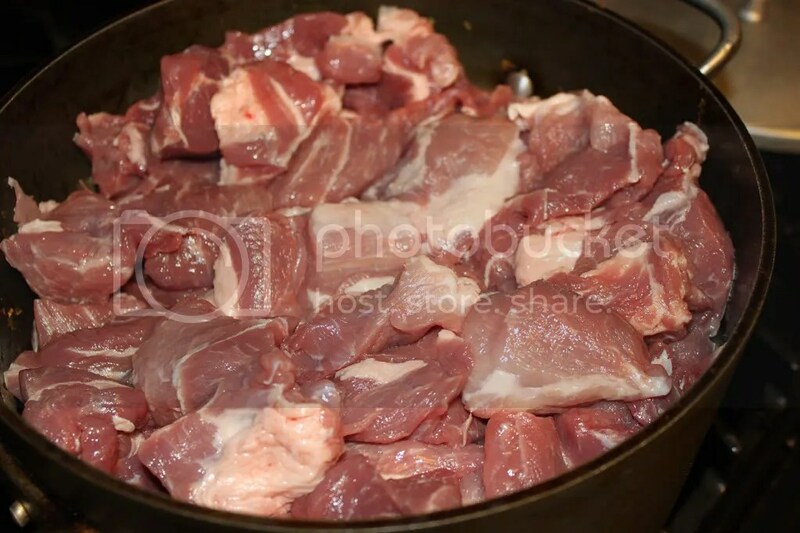 The grain in the pork should begin to show, meaning that it has become incredibly tender. Also it will have cooked down considerably. 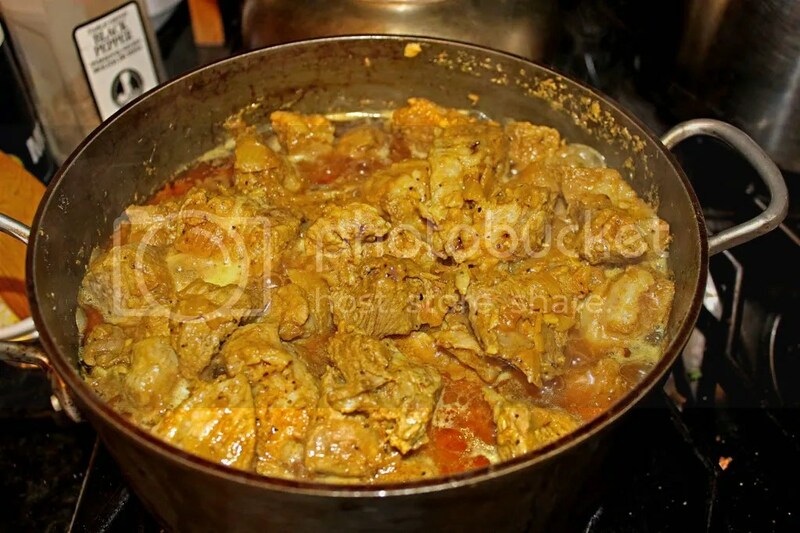 Thas some curry that is ready to be eaten! So, yeah it might seem like there wasn’t much too this recipe. That’s cause its SUPER EASY! Just takes patience and a little attention. Usually when we have curry we just serve it out of the pot BUT we were entertaining, so it had to look nice. 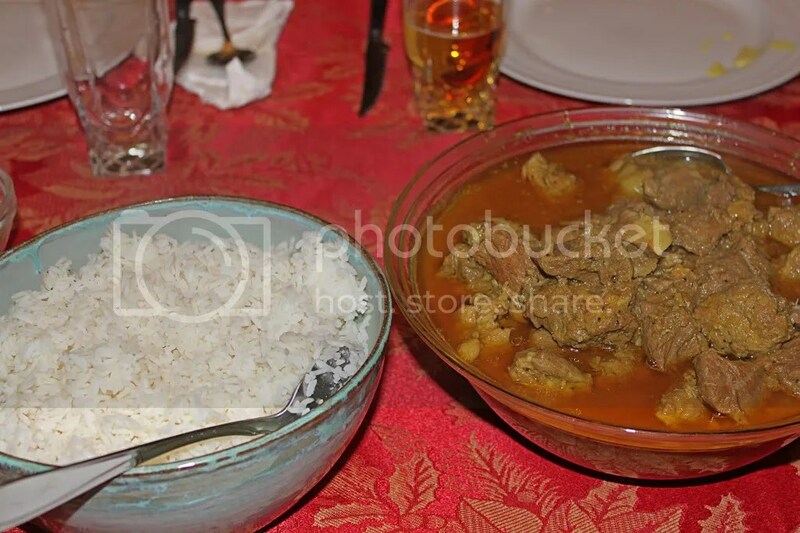 Next time you’re going to be entertaining a large carnivorous crowd, give pork curry a shot! Its cheap, easy to make, and deliciousssss. Do it. In a large heavy bottomed pot, heat oil over medium heat. 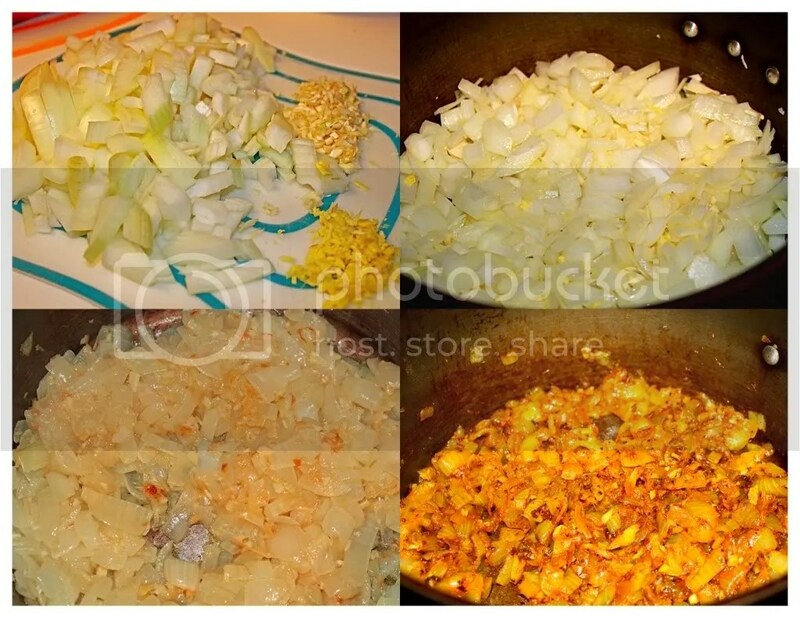 Once oil is hot add in garlic, onion, and ginger and let cook till all moisture has cooked off. At this point the onions will be translucent and the only moisture that will be left will be the oil. Add in the salt, pepper, paprika, turmeric, and curry powder, stir and let cook for about 3 minutes. 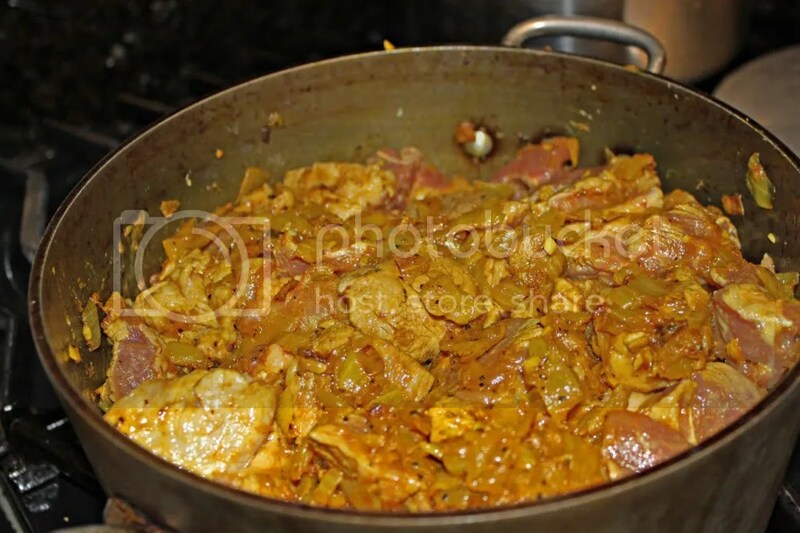 Add in pork and stir till thoroughly coated in spices. Let cook over medium heat for about an hour and a half, stirring constantly at first to make sure meat doesn’t stick or burn. 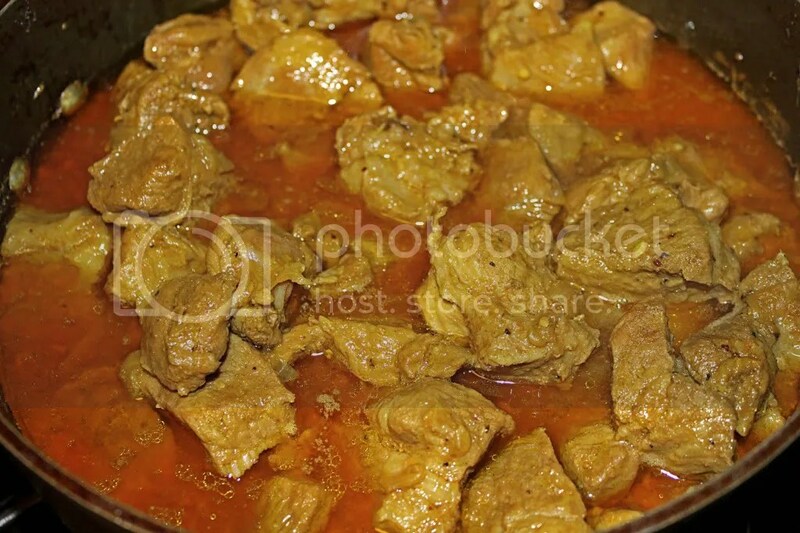 Curry is done when meat is tender and breaks apart easily. Hahaha thanks Mom. Definitely make that mistake a lot. I’m in the process of cooking this. It looked like a shortcut way to deliver some classic Burmese techniques but NO! It’s working incredibly well and the base is perfect. Thank you for this recipe. Great post! Love how you show the stages and add in-depth instruction. Nothing like good, sloooow food prepared properly.